Although the inhabitants of the old city of Venice have seen their fair share of floods (known locally as ‘aqua Alta’), most of them admit that the speed of the water and the unexpected level of rain surprised even them, leaving one of Italy’s main tourist draws 75% flooded. The floodwaters have by now climbed to about 5 feet above normal as officials admitted that it was the worst weather since 1979. Venice Mayor Mr. Luigi Brugnaro, who shared several videos from a flooded Piazza San Marco, renewed his call for government help with the “Moses project” would help prevent future catastrophes such as this weekend. The ‘Project Moses’ is a string of retractable gates meant to block the mouths of the city’s lagoons whenever these extremely high tides come in. In theory, Venice’s classical part would then be protected until the water retreats. Mr. Bob Henson, weather and climate blogger for Weather Underground said: "MOSE would indeed have helped with this particular event." "The water levels today reached 61.5 inches, which would have triggered the 43.3-inch gate closing of MOSE." However, the effort has been plagued by cost overruns and a corruption scandal ever since the mayoral offices began calling for it in 2003. For now, the cost stands at some 6.5 billion euros and has not had any effect. The mayor says that upon completion (expected in 2022), Venice will be safe. Meteorologist Chris Dolce: "A strong low-pressure system is spinning through southern Europe, spreading heavy rain and strong winds across northern Italy." "The strong winds triggered the inundation in Venice as they blew from south to north through the Adriatic Sea." Elsewhere in Italy, the storm system was blamed for at least six deaths. Wind damage that brought down trees and sent objects airborne was to blame for the deaths. A typical Weather cycle for Venice. I checked this semi-floating city ☺ has floods every 7-10 years. Nov 11, 2004 - High Tides and Flooding in Venice, Italy. 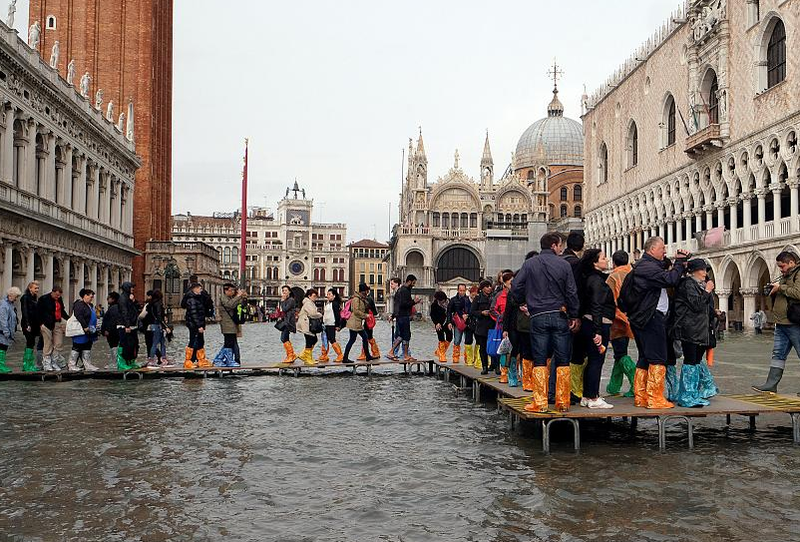 It happens with enough regularity that they have a name for it "Acqua alta (high water)"
For the annual flooding that occurs mainly in the winter months as a result of a convergence of high-tides. October through January are the typical high water season, though flooding can occur at any time during the year.